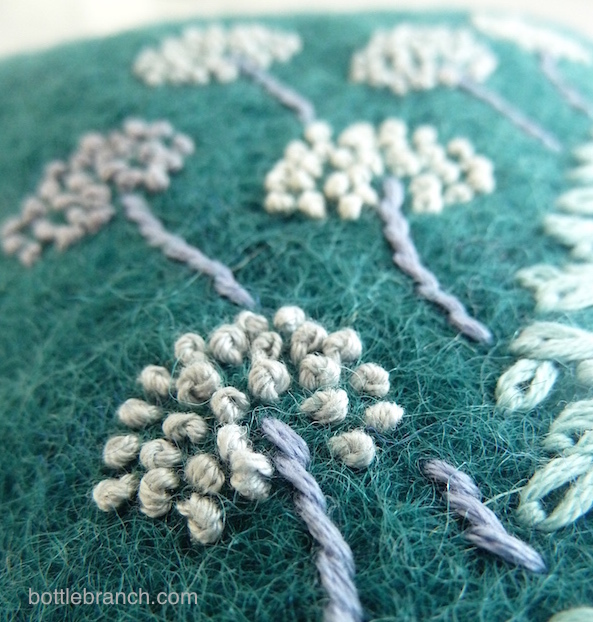 Fronds and Umbels Embroidery Giveaway! Sometimes I spend hours making something, set it aside, and then forget about it. And that’s exactly what happened with this embroidery project. Yesterday, after finding it in a mess of embroidery supplies, I reacquainted myself this little object, which I stitched in December, during an obsession with making small pouches inspired by a project in Aimee Ray’s book Doodle Stitching. 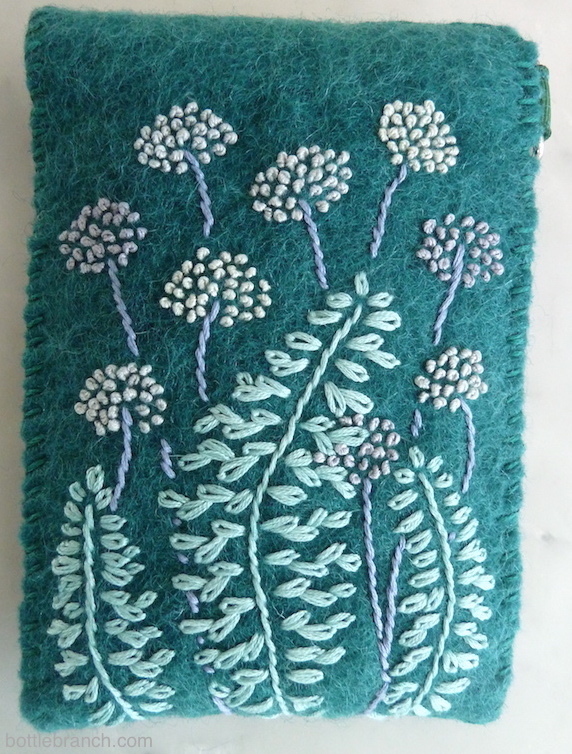 I’ve been calling this design “fronds and umbels” because, well, the fern-like frond motif, and the umbrella-shaped flowers, which are botanically speaking, umbels, like queen anne’s lace or allium. Stitching on thick wool felt was both satisfying and liberating. With no way to transfer a drawing or pattern onto the thick fibers, it was true free-hand doodle-stitching, and it was so much fun. If you’ve beeen reading this blog for long, you will not be surprised to learn I made this piece into an iphone case. (I have a slightly alarming history of making iPhone cases.) 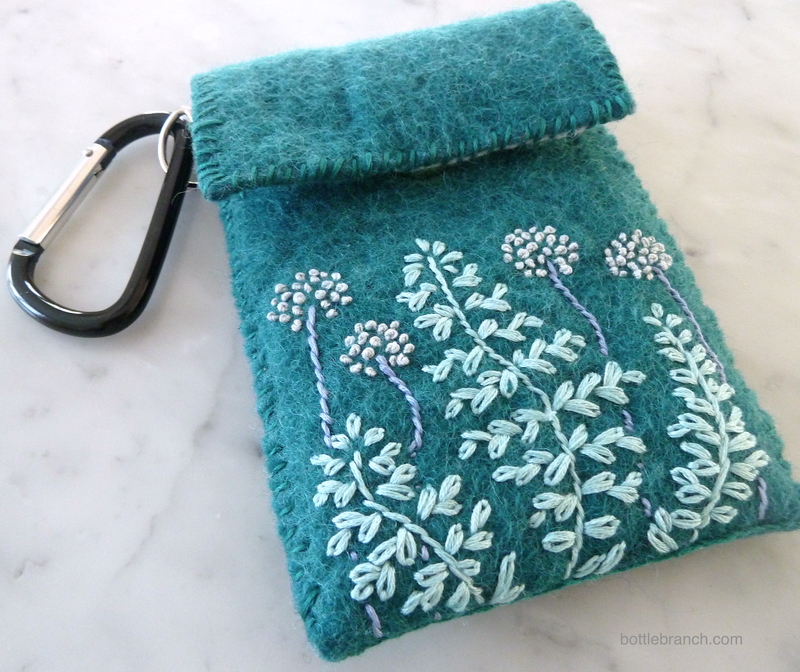 I lined it in a soft blue-grey 100% wool felt and added divider so there are 2 compartments. It closes with a magnetic snap. It is deliciously touchable and cozy and I do love it. The problem is, that I don’t need a phone case. As I recently related, I lost, then found my beloved needlepoint phone case in December. After that tearful reunion, I don’t plan on replacing it anytime soon. 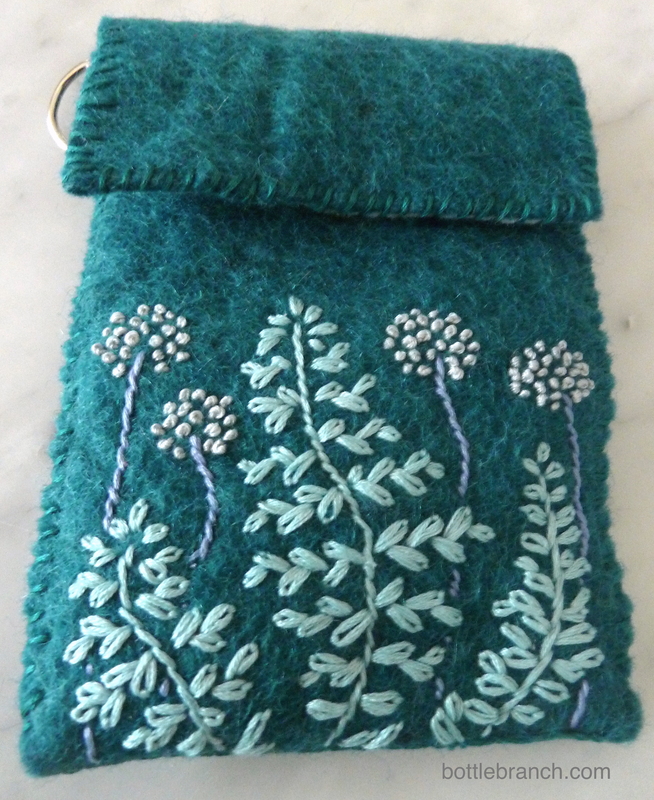 So, I’ve decided to give this embroidered phone case away to one lucky reader. It fits an iPhone 5S, iPhone 6 and probably a few other make/model phones. (And of course it does not have to be used for a phone.) I’ll even throw in a carabiner clip to go with it. I’ll post the randomly-drawn winner on Friday, March 6th 2015. Go ahead, give it a shot – your chances of winning are good! Thanks for reading, Pam. This was only about my third project with wool felt and I loved working with it – it just has such a great feel. I’ve never really tried crochet, but I love so many of the crochet projects I see. I’ve finally replaced my ancient brick of a phone and would be very proud if I had such a beautiful case for my new one. My favourite artistic pursuit is etching, my favourite form of procrastination is eating – but I also tidy a lot without it having any effect at all. Catherine, I had no idea you do etching! I love prints and print making, but etching remains a bit of a mystery to me. Judging by your beautiful quilts, I’m sure yours etchings are beautiful! Knitting is my favorite craft…lately I’ve been working on hats and learning to knit in colors. I’m working on another multi-colored reindeer and snowflake hat now. This bag is so cute! Wish I could do needlepoint, but my eyes aren’t good enough to work at that level of detail. I think you have to pick your craft, Greta. I feel somewhat wistful about knitting. I learned to knit when I was young from my grandmother, who was a prolific and accomplished knitter. My mother and sister still are, but somehow I missed the knitting gene. Knitting projects never really work out for me, so when I see so much amazing knitting going on around me and the beautful yarns, I get a pang. I love it Zibby! Since I don’t know how to make anything other than a mess, I would never be able to make something this beautiful. The colors are lovely! Oops, I didn’t answer the question! My favorite hobby is reading. Picking a favorite book is like Sophie’s Choice to me, but among my favorite are Little House series, Harry Potter series, anything by Salinger, Austen or Baggott. Thanks, Catherine! and yes, picking a favorite book is near-impossible but such a fun topic… you know I love Little House, HP, and Austen. Will have investigate Baggot… new to me?!! absolutely lovely work. I adore the color!! I’m awesome at procrastination and excel best with a good book and hot tea. I’m addicted to both (books and tea). I also try to avoid work by being outdoors. I love to hike and am working on my photography skills. I play around with writing, painting, photography, knitting….whatever crafty stuff strikes my fancy. Procrastination is my favorite hobby, so can I just tell you what I do to procrastinate? Read blogs by women who I think are out of the ordinary (including), follow endless clicks on google until my original research question has evolved into some esoteric discovery, paint furniture and then repaint it, figure out systems in my house that are part of my elusive quest for organization, move plants around, and listen to tiny desk concerts on npr. And I have a dog named Fern but wonder now if I should have named her Frond. Ha ha. That’s an impressive list, Annie! I can definitely relate to the endless google clicking, quest for organization, and moving plants around. Tiny desk concerts on NPR… that’s new to me. I’ll have to investigate! Hello, Zibby. I don’t follow many blogs, but I love yours. You do such beautiful work. I’m an avid knitter, and I’m the happiest knitter I can be when it’s for other knitters, or to exchange with friends who sew, etc. Someday, I will create my own patterns and designs. I’m learning photography with a new DSLR camera, which two of our classmates helped me select. For procrastination, Josephine the cat is always available, my husband and I seek out live music, I binge on TV series on Netflix (Marco Polo being the most recent), love to write hand-written letters, and look up apartment rentals in Paris, even when I have no idea when my next trip will be! Count me in, Elizabeth! 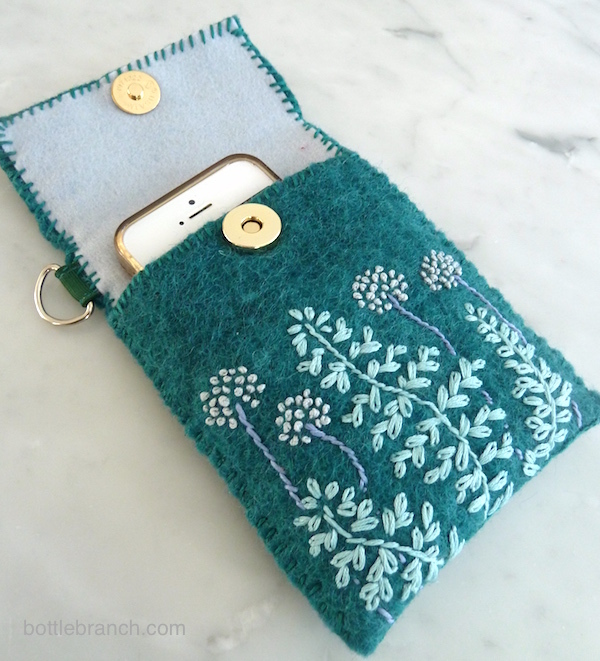 I’d love a handmade iPhone case from you! It’s gorgeous! Woops! I forgot to name my favorite craft: knitting. My sister-in-law just taught me to crochet at Thanksgiving, which I liked a lot, and I love sewing… And I think my favorite book recently is The Rosie Project by Graeme Simsion. Hilarious. Jennifer, I didn’t know you’re a knitter! How fun! And I’ll have to look into the The Rosie Project – who can’t use a good laugh? Beautiful design. Dreaming of spring. Zibby–This iPhone case is awesome, and it totally reminds me of you: the color and the design. Sadly, I am totally uncrafty. I used to knit in grad school, but I can’t say that I was very good at it! I am a huge procrastinator. One of my all time favorite books is Graham Swift’s Waterland, which, unfortunately, very few people have even heard of. I also loved The Lovely Bones and State of Wonder. Murakami and Marquez are both pretty great, but so is Austen, and what about Their Eyes Were Watching God? I could go on, but I must stop procrastinating ; ) But wait, the adolescent lit book, Wonder, is definitely worth reading. So darn good. Ok, I’m stopping, really. Suzy! Great to hear from you! I’ve read both Wonder and State of Wonder in the last 2 years and wow, great books. Books are an endless topic for conversation and yes, now I realize talking about them is a great way to procrastinate… I am adding Waterland to my list right now.